The Cumberland Valley Railroad is the oldest road in this sec- tion, and among the pioneer roads of the country. Its history is the history of the railroads of this valley, as well as the interesting story of the simpler, crude beginnings that have grown into the great railroad system of the country. The simplest statement of the facts is a story full of interest to the general reader. The board of managers, at a meeting held on the 21st of August, 1835, selected WILLIAM MILNER ROBERTS for Chief Engineer. On the 23d of October, 1835, MR. W. MILNER ROBERTS reported to the board of directors the results of his survey of the line from the Susquehanna River, opposite Harrisburg to Chambersburg. He estimated the cost of building the road to a connection with the Harrisburg & Lancaster Railroad, including the bridge across the Susquehanna at $564,064, and the average annual receipts of the road at $284,617.50. He calculated on 100 passengers each way per day at 3 cents per mile, and 35,000 tons of through freight and 51,950 tons of local freight, all at the rate of 4-1/2 cents per ton per mile. On February 21, 1836, the Pennsylvania Legislature granted autho- rity to bridge the Susquehanna and connect with the Pennsylvania Canal, and the Harrisburg, Portsmouth, Mount Joy & Lancaster Railroad, and authorized the managers of the Cumberland Valley Railroad to manage for uninterrupted communication of trade and travel between Chambers- burg and Philadelphia. The Cumberland Valley Railroad was opened for travel from White Hill to Carlisle in August, 1837, and through to Chambersburg in November of the same year. The first locomotive and cars were hauled across the Harrisburg Bridge (a part of which still stands), and over the turnpike to White Hill. The locomotive had two driving wheels, wooden spokes, was named "Cumberland Valley," and was built by WILLIAM NORRIS in Philadelphia. The passenger cars were like the old stage coaches. They had been run on the State road from Philadelphia to Columbia, and would seat, inside and out, fourteen passengers each. The railroad track consisted of cross ties laid four and a half feet apart upon the ground without ballast, upon which were laid oak stringers 5x9 inches, on which bar iron five-eights of an inch thick and two and a quarter inches wide was spiked. The ends of the iron bars were mitred, and the bar which extended on the inside of the track would become pressed away from its connection, so as to be caught on the flange of the wheels going in an opposite direction, causing them to turn against the bottom, and sometimes through the car. As a protection against the turning up of bars, the bottoms of the cars were covered with two-inch plank, inside of which was a liming of boiler plate, and at the time the road was opened to Chambersburg, the iron was not laid for about three miles from Chambersburg, and the cars were run in on the wooden stringers. at Philadelphia before 6 P.M.
arrive at Chambersburg at 10 P.M."
The first sleeping car ever used on any railroad was put in use on the Cumberland Valley railroad in the spring of 1839, a historical fact of great importance, because it was the first of the kind in the world. The berths were upholstered boards, in three rows, one above the other, held by leather straps, and in the daytime were folded back against the walls -- very simple and plain in construction, but comfortable, and in all essential features the germ of the luxurious sleeper of the present day. At that time travel between Philadelphia and Pittsburgh was by rail to Chambersburg, and stage from Chambersburg to Pittsburgh. Pas- sengers going east reached Chambersburg about midnight, and left about 1 A.M., reaching Harrisburg about 5 A.M. The oldest extant report of the operations of the Cumberland Val- ley Railroad was made by PRESIDENT McCOLLOH for the year 1839. In it he deplores "the general financial depression of the country, due to the error which has everywhere prevailed, of forcing public improve- ments further than the means of the country would justify." "We start," he says, "with half means, and are then forced to finish on credit at a ruinous cost, and one experience has been an example of this pre- vailing error." He finds hope, however, in the fact that "we are an energetic and elastic people, and with care and economy our wonted prosperity will soon be attained." He announces the purchase of three locomotives for $21,250, and two passenger cars at $4,175; that two passengers and one freight train are run each day between Chambersburg and Harrisburg, and that no injury has been done to any passenger since the road has been operated -- two and one-half years. On the 27th of April, 1840, THOS. G. McCOLLOH tendered his resig- nation as president of the company, and on the same day CHAS. B. PENROSE, of Carlisle, was elected by the board of managers to fill his place. On the 26th day of April, 1841, CHAS. B. PENROSE tendered his resignation of the presidency of the company, having accepted the po- sition of solicitor of the treasury, under the administration of GEN. HARRISON, at Washington. Upon its acceptance, on the same day, FREDERICK WATTS was unanimously chosen by the board to fill the posi- tion, which he held for thirty-two continuous years. The next report of which we find a copy was made by HON. FREDERICK WATTS, president for the year 1842, in which he states that the uni- versal depression of the last few years has had its effect upon the business of the company; but that it is hoped that prosperity will again bless the country, and if it does, he is confident that the stock of the Cumberland Valley Railroad will be profitable to its owners. The total earnings for the year were $70,116.82. For the year 1849, the earnings were $101,084.77, and the tonnage, which is for the first time shown, was 37,439, of which 7,818 was flour, 5,126 ore, 4,247 coal, 2,123 grain, 2,237 lumber. It is stated in the report for the year 1849 that "arrangements have been made to relay the road with heavy T rail." In March, 1832, the Franklin Railroad was chartered by the Penn- sylvania Legislature, and on January 16, 1837, by the Legislature of Maryland. The road was built from Chambersburg to Greencastle in 1837, and to Hagerstown in 1841. It was run by steam-power for two years, when an arrangement was made with the Cumberland Valley Railroad to operate the line and its own motive power was sold. It is worthy of note that the first cab ever put on a locomotive was placed on one of the Franklin Railroad locomotives, named "Washington," at the shops of the Cumberland Valley Railroad, in Chambersburg, in 1841. The Franklin Railroad was only operated a short time by the Cumberland Valley Rail- road, when steam-power was withdrawn, and it was then operated by Mr. D. O. GEHR, of Chambersburg, with horse-power. It was never profitable, and was sold several times, until, in 1860, it was rebuilt and laid with T rails. The Cumberland Valley then contracted to run it, and, with some changes in the contract, continued to do so, except during the time of its possession and partial destruction by the rebels, until 1865, when the two roads consolidated. In October, 1862, the rebels destroyed the shops and depot build- ings in Chambersburg, and on June 15, 1863, they made another raid, destroying all company property in the town, and tearing up and des- troying five miles of the track of the Franklin Railroad. The rebel raid and burning of Chambersburg July, 1864, also caused the company great inconvenience and loss. In 1871 the Southern Pennsylvania Railroad was opened from Marion to Richmond, Penn., and leased by the Cumberland Valley Railroad. In the year 1872 the Mont Alto Railroad was completed from a point near Scotland to Mont Alto. In 1873 the HON. FREDERICK WATTS, who had been president of the Cumberland Valley Railroad for thirty-two years, declined a re-election, as he had accepted the position of commissioner of agriculture at Washington, and Mr. THOMAS B. KENNEDY, of Chambersburg, was elected president. In this year the Martinsburg & Potomac Railroad was com- pleted, and leased by the Cumberland Valley Railroad. In June, 1882, the Shenandoah Valley Railroad was opened from Hagerstown to a connection with the Norfolk & Western Railroad, at Roanoke, Va., making a through line via the Cumberland Valley, between the northeast and southwest. From the year 1837 up to this time the business of the Cumberland Valley Railroad had been entirely local, that is, it had originated or terminated at local points on its road. 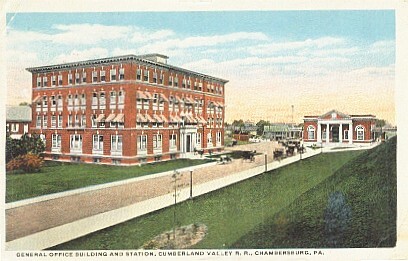 The management of the Cumberland Valley railroad has always been in close sympathy with the patrons of the road, giving all possible accommodations, and the benefit of the best transportation facilities of the times, keeping pace in improvements with the best and most enterprising railroad companies of the country. The Old "Tape Worm" Line was chartered about the same time the Cumberland Valley Railroad was -- or in 1835. This was the day of the rage of internal improvements in the country. THAD. STEVENS stood sponsor to this enterprise for many years. He was then a resident of Gettysburg, and had iron mills in Franklin County, and he wanted a railroad to his mills. The charter was for a road to start at Gettys- burg to run into Franklin County and then turn south, tapping the heart of the southern country wherever it was advisable and most convenient. The State made a large appropriation to the road, and the managers, when they came to spend the money, commenced all along the line. The result was, a great deal of money was expended, the appropriations were exhausted, the State internal improvement scheme collapsed, and the work stopped, and not a mile of the road was completed, and practically this was the end of the "Tape Worm." The Harrisburg & Potomac Railroad was chartered in 1870, as the Mermar Iron & Railroad Company. Its chief promoters were DANIEL V. and PETER A. AHL, of Newville. It was originally intended to pass through the country via Shippensburg, Mont Alto, Quincy and Waynesboro, but owing to financial difficulties was never completed. The Baltimore & Cumberland Valley Railroad was organized in 1876, to run from Chambersburg by a direct line through Waynesboro to a junction with the Western Maryland Railroad, at a point on the west slope of the Blue Ridge, two and one-half miles east of Smithsburg, and seventy-two miles west from Baltimore, the line to be built in the interest of the Western Maryland Road, and, when constructed, leased by it and operated. The length of the line, twenty-one miles, thus less- ening the old route, via Harrisburg, forty miles. The road was built, and May 18, 1886, the Cumberland Valley Railroad Extension Company leased the line to the Western Maryland Railroad, at an annual rental of $32,700. This is one of the most valuable lines now in Franklin County. It opens up to the trade of the county, not only a competing line to the eastern ports, but is the great highway to the South -- to Memphis, New Orleans, Savannah and all southern points. Mont Alto Railroad - In 1872 the Mont Alto Railroad, extending from Mont Alto to a connection with the Cumberland Valley Railroad at a point three and one-half miles northeast of Chambersburg, was built by the Mont Alto Railroad Company. GEO. B. WIESTLING, engineer and superintendent. It was opened for business on October 2, 1872. It was ten and one- quarter miles in length. During 1878 and 1879 the line was extended to Waynesboro, Penn., making the entire line eighteen miles in length. The extensive iron ore fields in the Mont Alto region were largely de- pended upon to furnish tonnage to the railroad, and it is only in prosperous stages of the iron business that this can be realized. In 1875 the magnificent summer resort, Mont Alto Park, was improv- ed and opened by GEO. B. WIESTLING, and has received the evidence of high appreciation by the liberal patronage bestowed upon it by the public. HISTORY OF FRANKLIN COUNTY PENNSYLVANIA ILLUSTRATED CHICAGO: WARNER, BEERS & CO., 1887 Chicago: JOHN MORRIS COMPANY, PRINTERS 118 and 120 Monroe Street. During the latter part of last, and the beginning of the present week, some eighteen cars passed over the Cumberland Valley Railroad, and arrived at the Depot in this place, loaded with the iron for relaying the track of the Franklin Railroad. This iron is o the very best quality being first class T rail. The workmen have commenced operations on the first section of the road, and along the entire line the timber is being delivered as fast as it can be produced. Mr. Sam'l Seibert, our esteemed fellow townsman, has been very successful in his contracts for lumber to construct the road, and has pushed forward the business entrusted to him with commendable energy. We are gratified to learn that the road is to be constructed under the Superintendency of Col. O. N. Lull. No better man could have been selected for the purpose. He is thoroughly conversant with railroad matters, and understands how to make as well as manage a road, equal to any other man in the country. We have no doubt whatever that this road will be completed and put in running order in a very few months. Its president A. J. Jones, Esq, of Harrisburg, deserves much credit for the successful manner in which he has surmounted all difficulties, and carried forward this enterprize to its present and gratifying prosperous condition. We are well satisfied in our mind that he will find it a safe and good investment, and one from which he will realize a handsome remuneration.